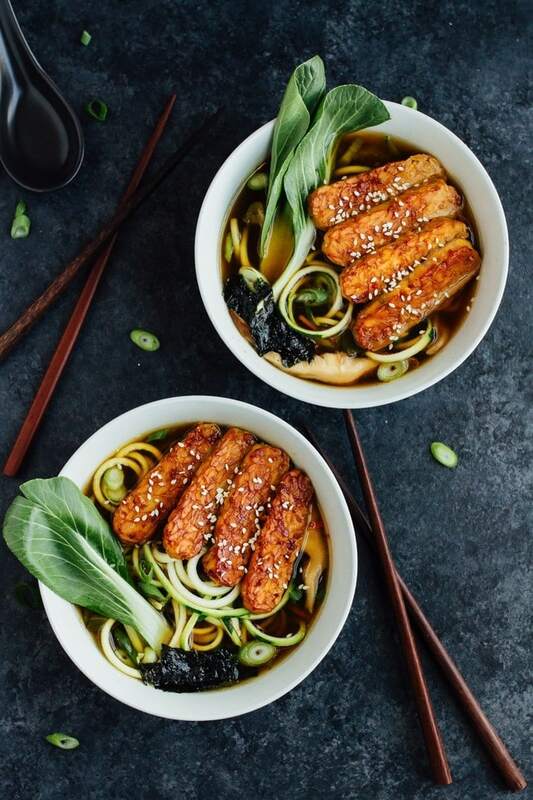 Vegan zucchini noodle ramen bowls with marinated tempeh in a quick-cooking miso mushroom broth. This ramen is savory, healthy and absolutely delicious. 17 grams of protein per bowl! Vegan and gluten-free. Would you believe that my first ramen experience was last year? And I’m talking real-deal ramen, because I definitely had instant ramen noodles (we called them Oodles of Noodles) growing up, but that doesn’t count. At this point, I’ve had ramen twice and both times were at authentic spots in Brooklyn, NY. Both were delicious and I immediately decided I wanted to try making a healthy and quick-cooking ramen bowl at home. A little experimenting and I came up with a delicious creation that starts with a savory mushroom, miso broth with carrots and bok choy. 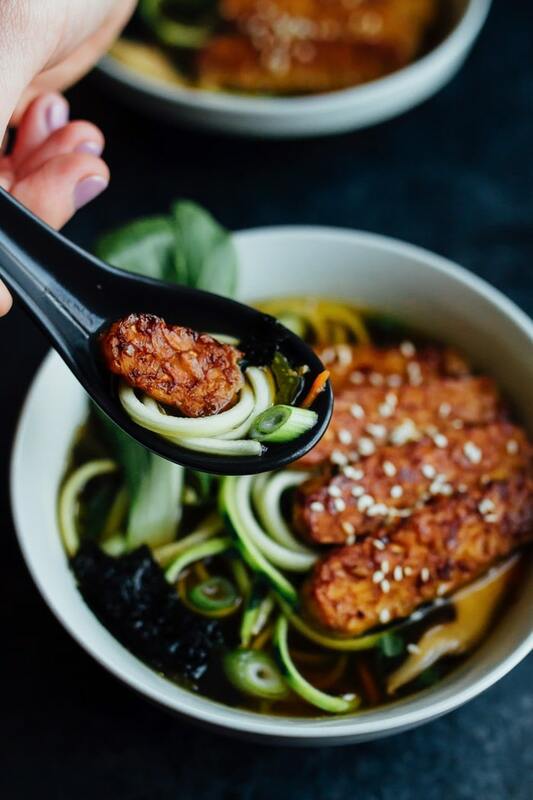 Once the broth has finished simmering, each bowl is loaded with zucchini noodles, bok choy, strips of pan-seared tempeh, nori, green onion and a sprinkle of sesame seeds. This was my first time using zucchini noodles in soup so I wasn’t sure how they hold up in broth, but they work perfectly. Because you add them in right before serving the ramen, they don’t have time to get mushy and they still have a little crunch, just like al dente noodles. 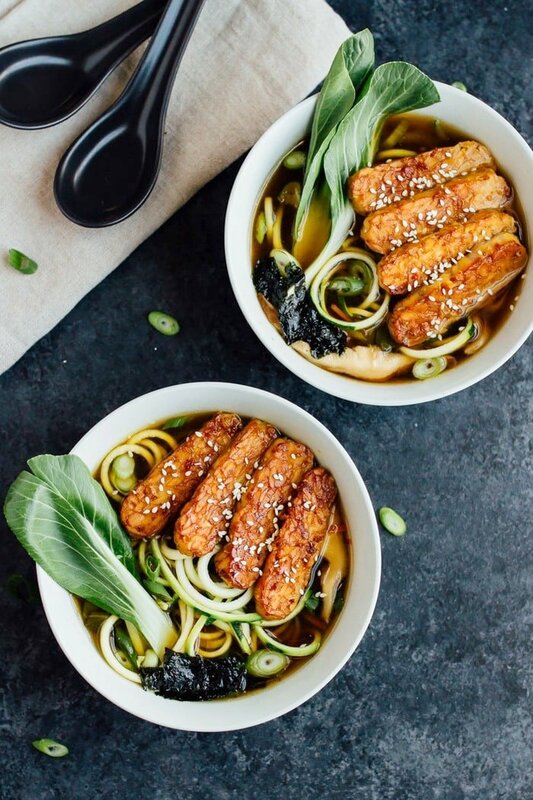 What really makes these ramen bowls is pan-seared tempeh! 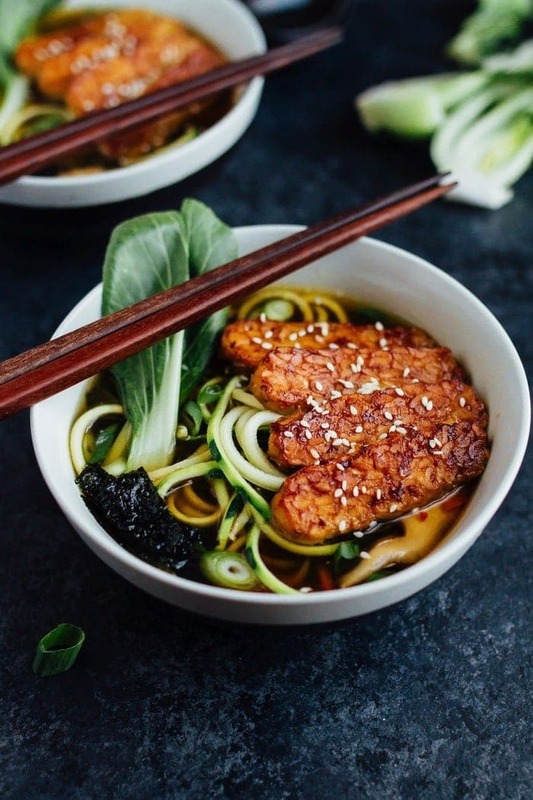 It adds a robust flavor from the tamari ginger marinade, gives the soup a meaty texture and adds a ton of protein, which makes the zucchini noodle ramen meal-worthy. Without the tempeh, the bowl wouldn’t be very filling! 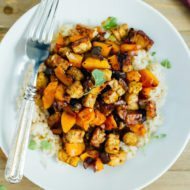 I know I’ve mentioned it before, but tempeh is one of my fav plant-based protein sources. If you’re new to tempeh and not quite sure where to find it in the grocery store, there are two main spots to look. The first is in the produce section and the second is in the section right near the yogurt. Some large grocery stores will keep it in the refrigerated area of the natural food section with other meat substitutes so be sure to check there as well. The most readily available brand (and the brand I use regularly) is Lightlife. They offer several different varieties, but my favorites are the original, wild rice, garden veggie and the three-grain. They’re all organic and non-gmo! 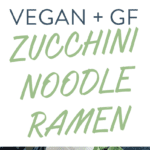 Any of the varieties will work for this zucchini noodle ramen recipe! 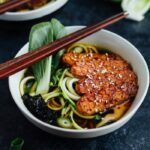 If you make these zucchini noodle ramen bowls, please be sure to leave a comment and star rating below. Your feedback is super helpful for the EBF team and other readers who are thinking about making the recipe. Make marinade by combining tamari, ginger, garlic, sesame oil, maple syrup, apple cider vinegar and red pepper flakes in a shallow container. Cut tempeh into thin slices and add to the container with the marinade. Toss to coat tempeh and set aside. Let the tempeh marinate anywhere from 30 minutes to overnight. Once tempeh has marinated, you’re ready to start the broth. Add 1 teaspoon of coconut oil to a large pot over medium heat. Add garlic and sauté until fragrant. Add shiitake mushrooms and chopped bok choy and sauté a bit longer — about 5 minutes. Add carrots, ginger, miso, Chinese five spice, vegetable stock and water into the pot and bring mixture to a boil. Once boiling, reduce heat and let simmer for 15-20 minutes. While broth is simmering, add 1 teaspoon coconut oil to a large skillet over medium heat. Once oil is hot, add marinated tempeh to the skillet and pour any remaining marinade into the pot with the broth for extra seasoning. Cook tempeh for 3 minutes on each side or until all the pieces are a little brown. Remove from heat and set aside. Once broth has simmered, taste and add tamari if needed. Ladle a little over 1 cup of warm mushroom broth into each bowl. Arrange extra bok choy leaves and a nori sheet around edges of the bowls. Place a few slices of tempeh in each bowl; top evenly with green onions and sesame seeds and serve immediately. Top with Sriracha or chili garlic sauce, if using. Love ramen but what a great idea to use zucchini noodles. Also, tempeh forever! What a cool recipe! I love ramen! I think I’m going to make this tonight for dinner. What brand of white miso did you use? & where can I get it??? I really like the Westbrae Natural brand. You can get it at Whole Foods or other natural grocery stores. I essentially grew up vegetarian because my mom is a vegetarian, yet I’ve never cooked with tempeh. Your ramen recipe is convincing me that I need to, though! This looks so so tasty. Yes, it’s so delicious and easy to cook with! 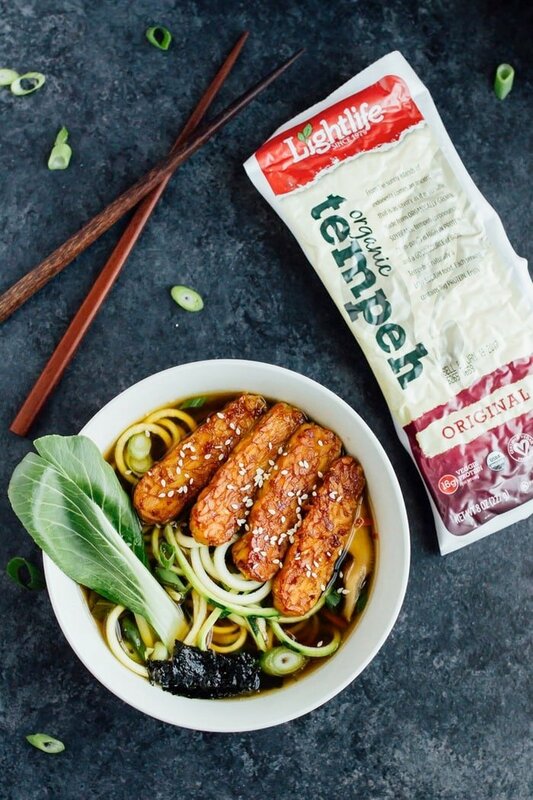 I have a ton of great tempeh recipes, but this ramen is a great place to start. If you do try it, you’ll have to let me know how it turns out. Thanks so much, Kim. I hope you get a chance to try the recipe. This looks so dang appetizing, I’m sure I wouldn’t miss the ramen noodles one tiny bit! This looks so good and Would like to try it. Is the miso in paste or powder form? It’s in paste form. You can find it in the refrigerated section at most natural grocery stores. Do you cook the zucchini noodles first? Or raw? Hi Angela. No need to cook the zucchini noodles first. They’ll soften up in the hot broth. Hi! 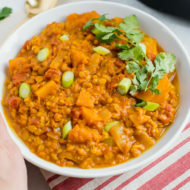 This looks superdelicious and I really want to try make it! Thing is though, I dont think we have the chinese five spice in my country so is there an easy substitute that I can use instead? 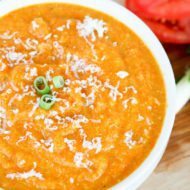 This recipe looked daunting at first because of the many ingredients! I convinced myself to make it anyway and it turned out amazing! I couldn’t find white miso and used red instead. This was so delicious!